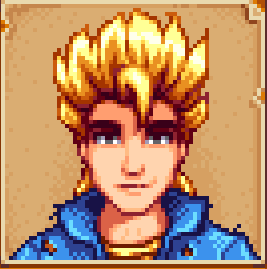 The closest thing Stardew Valley has to a surfer dude, Sam is a cheery, pleasant guy. Generally optimistic about the world - or unwilling to show otherwise, at least - Sam seems to take life one day at a time, and has few complaints. There's a bit of a brooding undertone to his happy facade, however, and all the jam sessions in the world can't cover up the occasional youthful insecurity. Sam lives at 1 Willow Lane with his mother, Jodi, and brother, Vincent. His father Kent will return home in the second year to live with him, as well. Sam is a good-humoured troublemaker, prone to occasional pranks and mucking about the community that earns him chastisement from his elders. On Mondays and Wednesdays he works at JojaMart; otherwise, Sam spends his days playing guitar, shredding on a skateboard, and hanging around with Sebastian and Abigail. Sam is a typical teenager in his tastes, even if he's not actually a teenager (hard to tell), and likes junk food. He loves Pizza and Maple Bars, and follows 'em up with Joja Colas, Ice Creams, and other sweets. He also seems to enjoy Cheese and Eggs, and will accept pretty much any valuable gem. Sam is much less enthusiastic about his greens. He won't show much interest in grown produce or foraged items. He also hates Mayonnaise, despite liking Eggs. Sam is a bit like Sebastian initially in that he often stays in his bedroom, just out of reach, and generally sleeps late. You won't see him up and about until 10 am, and even then he may linger in his room for quite a while. This is particularly true on rainy days, where he spends pretty much the entire day lounging about in his home. On Mondays and Wednesdays Sam works at JojaMart from 12 pm until 4 pm; on Fridays he can be found at the Stardrop Saloon, starting 'round 3 pm. During Spring and some of the other seasons he likes to loiter down by the water, south of the Mayor's Manor, around midday. During the Summer Sam will take Vincent down to the beach around 1 pm when he isn't doing anything else during a day. During Fall Sam tends to take walks to the forest west of town for much of the day. During Winter Sam spends a great deal more time in the Saloon, and can be found there in the early afternoon up until about 7 pm. At two hearts you can trigger an event by visiting Sam's house before dark. At four hearts you'll find Sam snacking in his house. I'm pretty sure Jodi needs to be in, as well, so try this early in the day. At six hearts you can see a scene with Sam in Pelican Town. It will trigger during the day. At eight hearts Sam will show up on your doorstep, asking you to see his concert. Head to the Bus Stop by 4 pm of the same day to trigger a cut scene where you watch him play. How the scene plays out varies based on an answer you gave in an earlier scene. At ten hearts, after you've given Sam a Bouquet, you'll get a letter from Sam requesting that you meet him in front of his house. Head to Pelican Town after 8 pm to trigger the scene, then stay in Sam's bed for some smoochin'. After this scene you can purchase a Mermaid's Pendant and ask Sam to marry you. do you need to have 6 hearts with sam already to have 6 hearts with sam or nah? ?